You might be a bit nervous about transporting students with service dogs, but have no fear. According to Guide Dogs of America, these pups have been through 4-6 months of training - including riding buses, subways, and escalators - so they are well prepared for riding your school bus. And their owners have been trained (at least 4 weeks in class) on how to handle them, as well. If you still happen to be anxious about transporting a live animal, let’s go over some basics. The other riders on your bus may get excited about having a dog on board. (Who can blame them?) However, it would be wise to educate them about the purpose of the dog and to stress that it’s not for petting. Even if you don’t necessarily have assigned seating for all passengers in your bus, you will want to have a designated seat for your guide dog and owner. That way, the dog knows exactly where to lead the student upon entering the bus. Consistency is key. 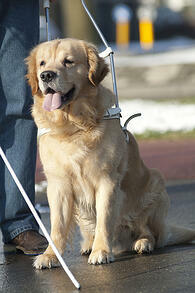 Guide dogs are given to help impaired people see and hear. Thus, the dog is trained to alert the owner to intruders or sounds and to provide minimal protection. Don’t be alarmed if the guide dog reacts to loud noises or being approached; they’re simply doing their job. Most guide dogs are very docile and well behaved. However, dogs - like humans - can have bad days, too. In the unlikely event that a guide dog misbehaves or puts someone in danger, make sure it is reported to the owner’s parents and/or principal. By educating your other students, designating a seat, understanding their purpose and reporting any problems, you are doing all that you can to make sure this guide dog and owner are being treated fairly and safely. Safe and happy travels!